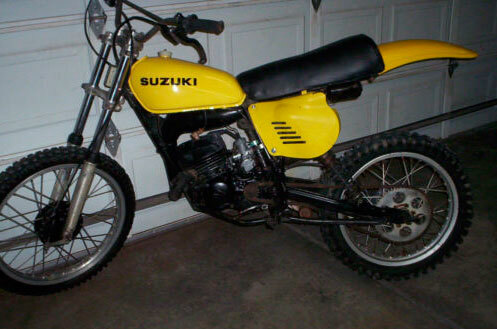 For sale is a 1976 Suzuki RM125 . The bike is mostly original except the rear fender . The bike runs and shifts through the gears fine . It has a new seat cover. The tank on the bike is not being sold with the bike ,see attached picture for the tank that go’s with the bike . I do vintage dirt bike tank restoration’s and if you would like the tank done or any other tank let me know . Bike needs a front fender and tires . This bike is a perfect core for a restoration . The clutch cover has been repaired , someone had the wrong kicker on it and damanged the cover it doe’s not leak any oil .The bike will be sold with a notorized bill of sale . If you have any other question’s let me know . I know a few shippers so if you need help with crating or setting up transportation let me know . If the bike needs crating I charge $100.00 to crate it . I use a motorcycle shipping crate that can bill lifted with a fork lift or pallet jack .